Yesterday evening I went to see my very first 3D movie: Chronicles of Narnia: The Voyage of the Dawn Treader. I know, hopeless. Why did I not see Avatar? Or Tron? Well, that’s the way it goes. On the other hand, the experience was not as exciting or as beautiful as I’d hoped. One scene of snowflakes falling around Lucy was nice – otherwise I didn’t feel the 3D experience added anything. 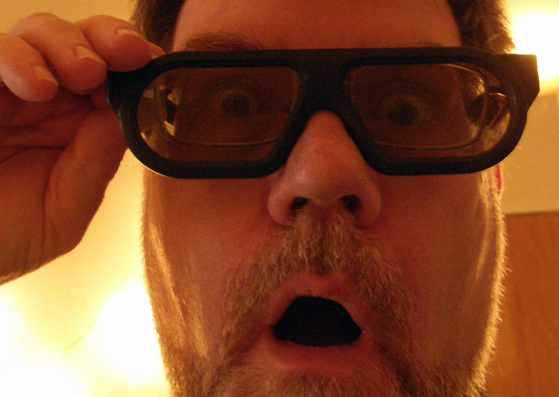 Still, I should probably try out a made-for-3D film before dismissing a whole technology. I didn’t enjoy having to hold the extra glasses on my nose Â (see picture). I obviously have a short nose. And I particularly didn’t like the subtitles hovering above the surface of the film – though perhaps that’s something one would get used to.